After a decade-long career with Brooklyn-based dream pop duo Exitmusic, which he co-founded with his ex-wife Aleksa Palladino, Devon Church has finally embarked on his debut solo journey. The move comes after the dissolution of Church and Palladino's marriage, with Church's debut full-length album arriving just a few months after Exitmusic's latest album 'The Recognitions', which released earlier this year. When asked if the album is the last we'll see of Exitmusic, Church said "Well, that remains to be seen," with a hint of uncertainty in a telephonic interview with Meaww. So even if Devon is branching out on a musical journey of his own, there is a chance that Exitmusic fans can still see the duo put out more music. The latest offering from the duo came in the form of the music video for 'Trumpets Fade', which was unveiled last month. Exitmusic is known for haunting soundscapes and hair-raising emotional climaxes, driven by Church's skills as a producer, multi-instrumentalist and songwriter, and topped off with Palladino's dreamy vocals. 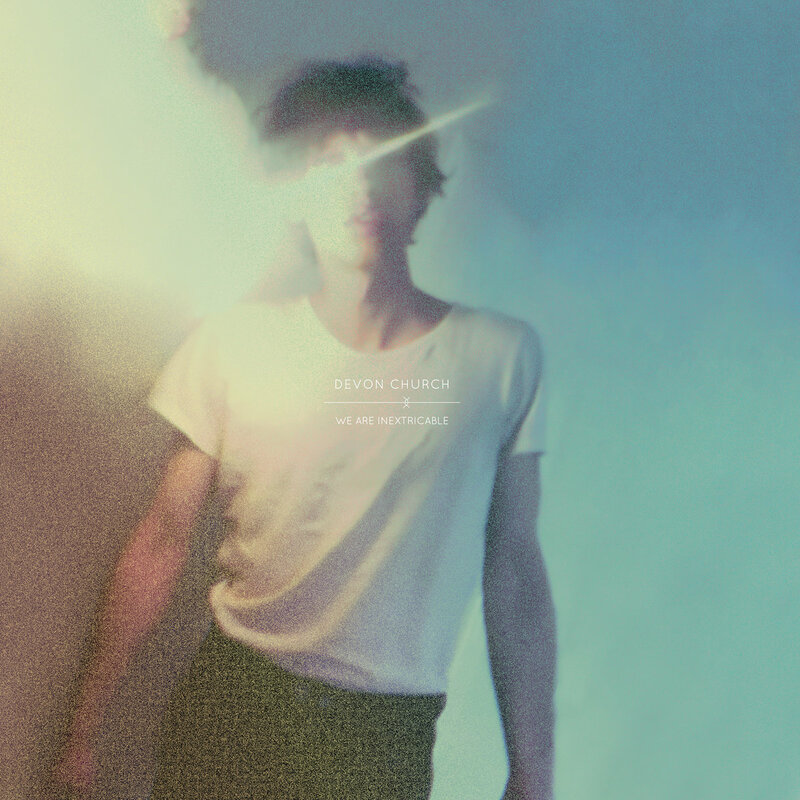 Church's skills take center stage on his debut LP 'We Are Inextricable', but what will surprise both new listeners and old, is the stunning vocals of the Winnipeg-born artiste, a voice that is immediately reminiscent of a young Leonard Cohen. The Cohenesque vocals, combined with an ocean of drone, psychedelic minimalism, harmonic noise and free-flowing poetry for lyricism makes 'We Are Inextricable' a deep and absorbing record. The sensuous, surrealist lyrics — touching on themes of romantic obsession, religious ambivalence, dysfunctional families, and the ineffable strangeness of human existence — are delivered through Church's soulful baritone, over trance-inducing, tape-saturated echoes of minimalist and ambient compositions. With primitive drum machines, shakers, tambourines, and delirious, overdriven synthesizers, the album is total eargasm material. "It took me a while to get comfortable with it," says Devon, talking about finally putting his husky, baritone voice to its fullest potential. "If you actually go back to Exitmusic's discography, in 2007, we self-released an album ('The Decline of the West') and I did vocals on a couple of songs on that. It actually started with a few songs that Aleksa and I traded back and forth. It sort of had a Blonde Redhead, Sonic Youth kind of feel during the conception of the bond. In the sense of having a male and female frontman... frontpeople? And Aleksa at the time was finding her voice and I was more into production and also too shy to sing," he admits. The album opener 'Chamomille' starts with a simple four-chord progression before Church snarls in with the strangest combination of words which somehow paint an immediately lucid, surreal image. "Eggshell white / Bathroom door / Opens like a cold sore," he sings. When asked where the line came from and how the album came to be, Church replies: "The cold sore thing... I don't know how I feel about it now, but that's just how it is," followed by a shy laugh. "An egg is a good image to start with! If you want to start anew, an egg is a great. It's very primal and also signifies a new beginning." Explaining how the album was conceptualized, he goes on to say, "Since Aleksa and I parted ways, I'd been recording music to kind of just figure out what I wanted to do. So I finished an EP. And 'Chamomille' and 'We Are Inextricable' were on the EP, in different versions. And everything else on it I just threw away and then I wrote the core of the two songs which sort of finally became this album. But also, that feeling of how you've tried everything and you give up... You're just like 'I put so much work into trying to make something good... and then it wasn't good,' and then there's something in the feeling of that surrender that made this album possible. That I was just like, whatever wants to come out now, I'm just gonna get out of the way and let it happen." Church addresses a range of themes that are often dark, moody and contemplative. 'Chamomille' addresses a conflicted psyche with the chorus line ("Life is for the living and you’re meant to be free") taken from a teabag, repurposed as a sarcastic suicide note. 'Your Father's House' muses on a family history of addiction and mental illness. While 'Nothing Is Revealed' meditates on the adult effects of childhood trauma, 'Now That I'm Dead' comes from a psychedelic breakthrough experience. There is a strong dichotomy in the sound of the album. The traditional singer-songwriter approach blends with an eclectic range of sounds and instruments, with the production adding deft touches with atmospheric noise and tape delays. "That was really the challenge for me," Church explains about this combination which he pulls of perfectly. "I do have these two sides to my personality. Rather my musical personality. Electronic music, you know I'm into stuff like Portishead and [Ryuichi] Sakamoto. But then the tradition that I'm rooted in is more of a singer-songwriter thing. I really had to get down to the heart of what I feel like as a writer of songs. And not because it's what I want to be. It's just because it's the only thing I happen to be very good at. So that was the challenge. Not to fall into a Singer-songwriter bracket. Not to make it feel like a cliche or something that was too familiar. Like I wouldn't feel comfortable doing what... I don't know, maybe what Father John Misty does or somebody like that... sound from a different era, you know what I mean? So it's my attempt at merging these two different approaches." "It's a successful attempt," we say to Church. "It sounds like Leonard Cohen discovered a room full of synthesizers!" "That was what my initial idea for it, a long time ago" Church replies to our pleasant surprise while admitting that Cohen is definitely a big influence on him. "But I kind of strayed. But you know, interestingly Leonard Cohen did have a vast collection of synthesizers. He was a synth nerd! He liked really cheesy synths though and he had a huge collection of it. At least, that's what I'm told." Both Cohen and Church are Canadian and when we point that out, he says, "Yes, but Cohen was from Montreal, which is a lot different to where I'm from. I'm from Winnipeg, which is sort of like the country music part of Canada. But Neil Young is actually from Winnipeg, and that's another inspiration." Church reveals that he played almost all of the instruments and also produced the album himself, with a little help from his friends on backing vocals and live drums on the opening track. The DIY ethos doesn't really show on the record and we are surprised to learn that most of the album was recorded in Devon's apartment. "A part of the density of the instrumentation is just me not wanting to book a studio and wanting to do everything in my apartment." 'We Are Inextricable' is a welcome digression from the slew of politically charged albums of 2018, and takes on metaphysical themes instead, contemplating on the nature of the self and beyond. It's the kind of album that's perfect to sit down and lose yourself in after a hard day's work or even drift through the woods with headphones on. You can stream the full album below.